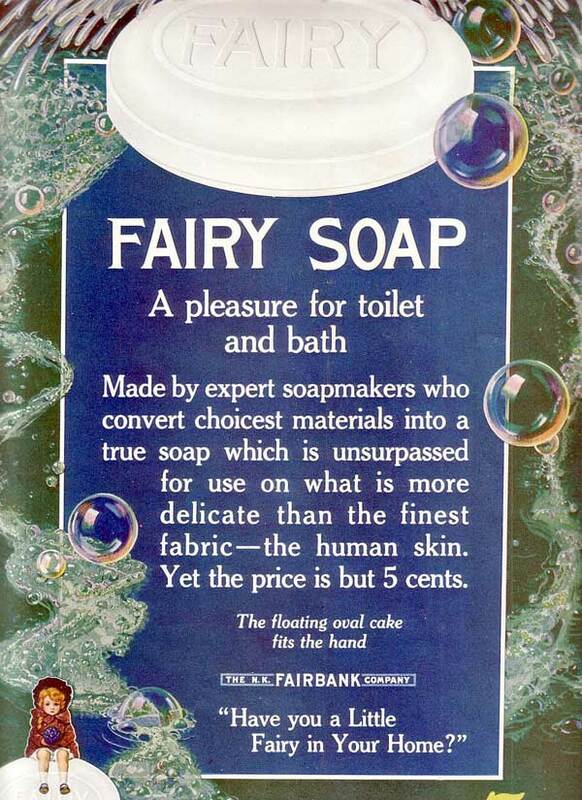 Here at Fairies World we are often asked about Fairy Soap, not present day scented bars with Fairies made in soap on the top, but a soap branded 'Fairy'. 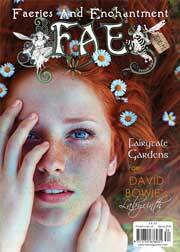 To Europeans 'Fairy' is a well marketed and famous popular brand, yet whilst it originated in USA and now belongs to one of the world's largest and most successful international companies Procter and Gamble, the Fairy Brand is not one widely known in USA. It was Nathaniel Kellogg Fairbanks who was born in Sodus, New York County in 1829 and who moved to Chicago after the civil war where he created a business importing cottonseed oil and processing the manufacturing of soaps, one being Fairy Soap which was named, of course, from the first four letters of Fairbanks last name. 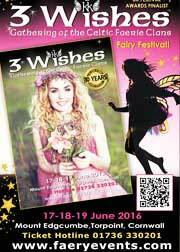 The trademark of the little fairy was modelled by a young girl and featured on the product for over 75 years. 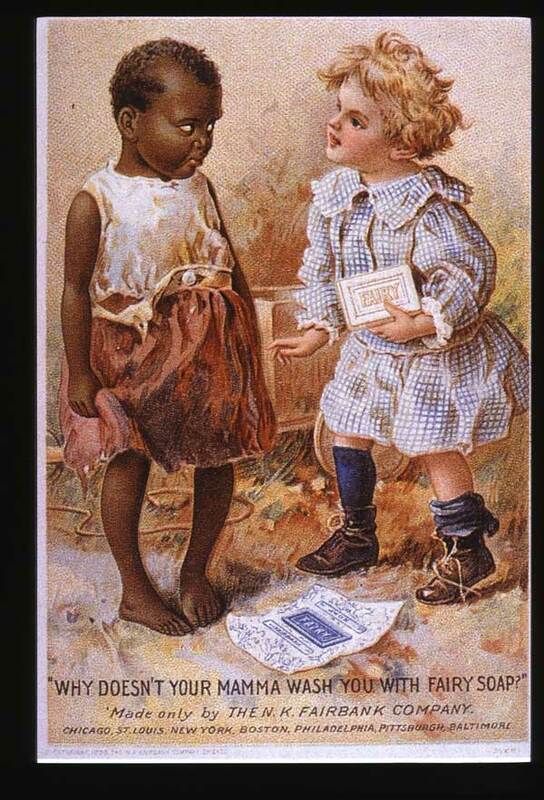 It was a white soap that floated made popular in those days at the end of the nineteenth century as an alternative to trying to find normal soap bars in the bottom of the bathtub or sink, it was a competitor to Ivory soap made by Procter and Gamble the originator of floating soap made since 1878. 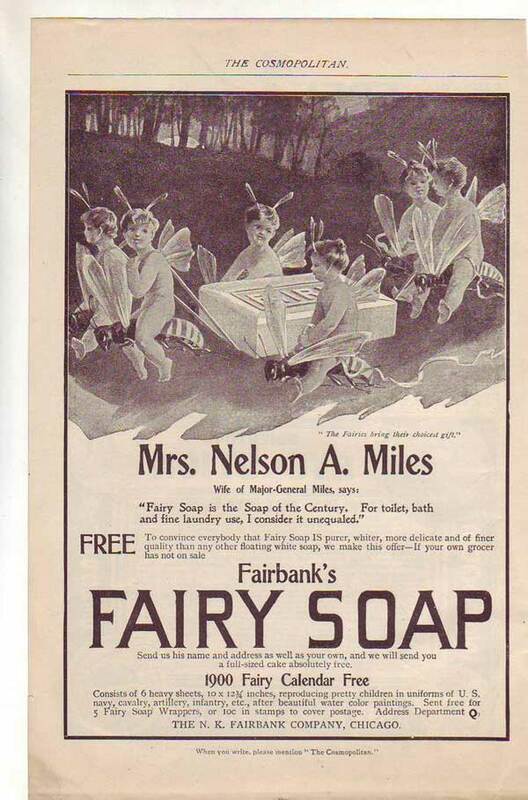 The Fairy idea was very effective for advertising and many people remember their mothers insisting on Fairy Soap being used for their Saturday night baths encouraged by the give away coloring booklet published by The Fairbank Company with images drawn by AW Kemble an artist with the Chicago Daily Graphic Newspaper. By coincidence, also in 1837, another company Thomas Hedley & Co. was established in Newcastle upon Tyne, England UK making soap and candles. 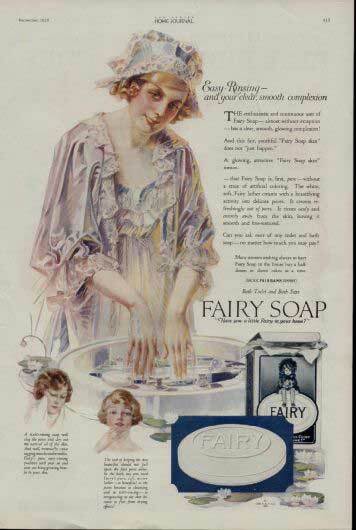 The company bought the rights to the word 'Fairy' from Fairbanks and launched the first all-purpose soap in 1898 so in England Fairy Soap was marketed by Thomas Hedley Ltd. 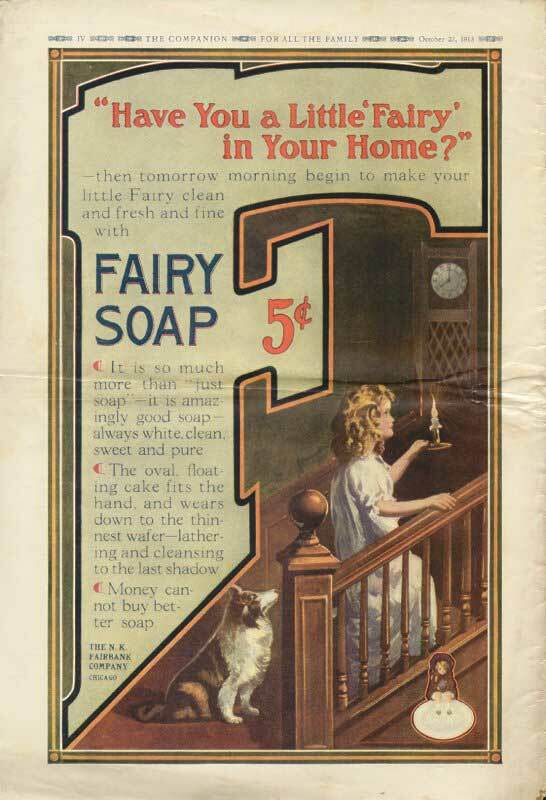 However many years later in 1930, the ever expanding Procter and Gamble Company established its first overseas subsidiary with the acquisition of Thomas Hedley & Co. Ltd thus taking over and acquiring the production and marketing of the Fairy brand for Europe. Fairy remains one of the best-known European household product names to this day the name appears on a variety of fine household cleaning products.